As you can tell, the castle’s general architecture is still as over the top fancy and complex as it always was. That’s one heck of a creepy looking door. Flying dragon like heads try to kill the protagonist. This looks a lot less scary when you remember that Super Mario 3D Land has a fairly similar looking monster with similar attacks. No idea what kind of magic is involved here, but the way the enemy seems to be flying at the wall looks hilarious. Seriously, if it was meant to look cool, it doesn’t work, the enemy looks like he’s just been tripped over while running. Another castle room. Not sure what’s going on here, that arch looks like the perfect place to position a falling guillotine blade. The castle from a distance. As you may have immediately noticed, the moon is very, very prominent in Castlevania backgrounds. Zombies! The last one seems to be headless too, did the hero go that way and kill it first, or do these monsters just come at you already decapitated? What looks to be either a prison or storehouse, likely in the castle basement. Okay. Holding the removed head of your enemies is pretty cool. Part of what appears to be a potion making lab or something. Man, this game really does seem to be throwing in every gothic fantasy cliche under the sun, doesn’t it? Some kind of ugly monstrosity likely found as an enemy. What’s it meant to be? Who knows? One heck of a creepy looking character. God, this artwork is pretty amazing looking, don’t you think? And the flame really helps the scene, since the lighting seems to be superb. Some kind of gross looking monster. Really, is there a better term to use to describe whatever this monstrosity is? A generic zombie enemy. To say it looks like it’s suffering advanced grade decomposition is an understatement. Some sort of harpy like monster. I distinctly recall seeing something like this in a previous Castlevania game, or at least hearing that said enemies were in them. Part of what looks like a creepy chapel. Really, every Castlevania game needs one. A clock. As expected, the game seems to take place at night. An absolutely awesome looking creepy village scene. Of note is the poor guy being hanged in the foreground. Looks a lot like one of the Belmonts too, was he hanged for actually trying to fight Dracula among a village of deranged cultists? Part of a hall inside the castle. Looks like the place has took quite a battering, look at all the rubble lying around! Erm… something. Really, I’m not too sure what’s going on here, other than that an entrance seems to be located inside an horrifically creepy giant mouth. A fancy room in the castle. Nothing more to be said. A moody interior with a creepy looking green lighting effect. Very atmospheric. Three of the game’s protagonists/playable characters. As you can tell from the screens above, Castlevania Lords of Shadow Mirror of Fate looks like a great new Castlevania game. Yes 3D hasn’t worked that well in the series before and the game seems to mix 2D and 3D sections all over the place, but the style of the series has certainly been gotten down correctly in these pictures. And with the game looking like a horror movie brought to life, it definitely seems like a game to check out in the future. 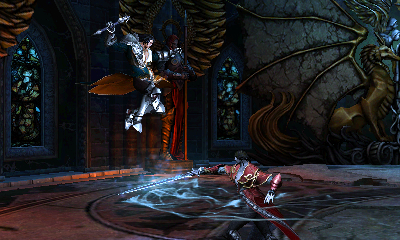 Castlevania Lords of Shadow Mirror of Fate; Footage, Screens and More! Castlevania Lords of Shadow Mirror of Fate; More Artwork and Screenshots!